The simple answer to the question “what is Holi?” is that, Holi is the festival of colors and marks the triumph of good over evil. It is as important to Hindus as Christmas is for Christians. It is also the opportunity to convey your message of love, trust and brotherhood to your family and friends. Yoovite.com offers you the best online tool by which you can invite your loved ones for Holi celebrations in your house. People get together in order to share fun and excitement during this colorful festival. There are several things you can do during Holi. You can buy gifts; play with colors, dance, sing and much more. It is all about positive vibrations in and around your friends and relatives. Your gifts should portray the real picture of Holi and must consider the spirit of the festival. You should also consider your relationship with the recipient and should convey your love and care. Your budget is also important but don’t be too stingy. Further, know the likes and dislikes of the recipient in order to choose the best gift for him/her. You can be as creative as possible but make sure that the recipient likes what you give. Some of the popular Holi gifts are sweets, chocolates, apparels, dry fruits, Holi color pack, Holi gift hampers, Holi tour packages, wall hangings, idols, Holi home decoration items, Holi greetings cards, gifts for kids, home care kit etc. 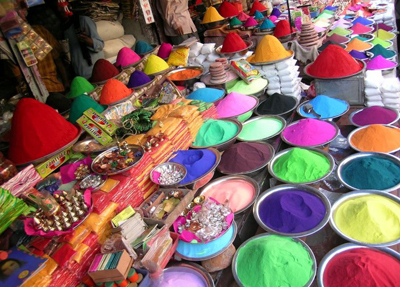 The crux about Holi is its colors. You wallow in color for the whole day at various degrees. Usually color powder and colored water is used in addition to balloons filled with colored water. Water balloon fight is a famous activity during this day. You also paint each other’s face with color powder. Colors are available in all stores during the days before Holi and you can get them easily. Just make sure that you buy ones that don’t have allergic reactions. Though you buy dress for each other, you don’t really wear new dresses during that day. If you have old white dresses, you should wear that since it will be drenched in colors. 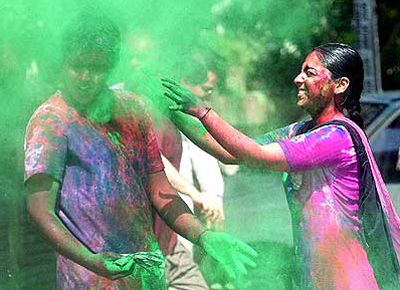 You can also dance to Holi songs while throwing colors to each other. It is easy to do it in the street adjoining your house. There is no such thing called traditional Holi dishes. You do make vegetarian food with lots of sweets. You can also buy sweets if the number of guests is more. You don’t have to arrange food outside your home. Just make sure that every one arrives on time and you can have caterers to take care of everyone.